Alfalfa | Kitchen Seed Company Inc.
After several years of university and on-farm testing, Kitchen Seed Company is proud to offer five premium alfalfa varieties. We have carefully selected these genetics for their top of the line traits and high yield potential. 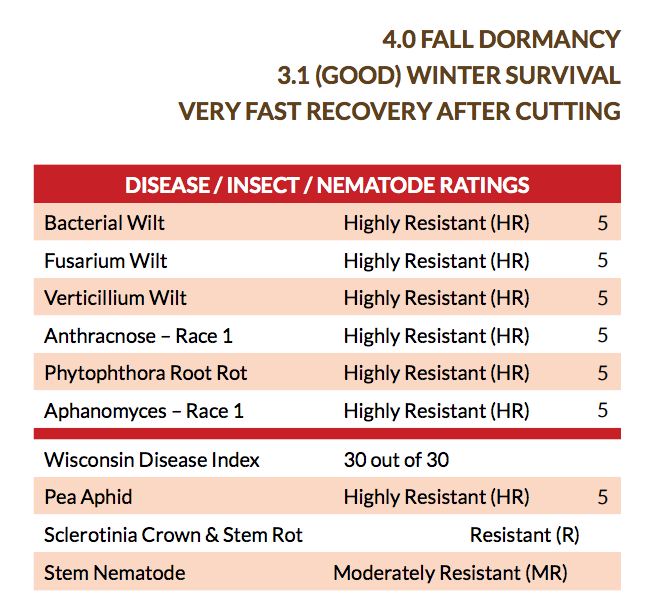 Our products exhibit excellent fall dormancy, hardy winter survival ratings, and resistant to highly resistant disease packages. With our ability to meticulously examine various varieties, we believe the varieties we have available offer excellent, quick regrow and the best overall quality and tonnage. KSC EXTENDER IV is a new improved version of KSC Extender III Alfalfa. This productive variety is highly resistant to all major disease pests and offers resistance to Sclerotinia crown and stem rot. KSC EXTENDER IV also is resistant to Pea Aphid and Stem Nematode and displays excellent tolerance to Lepto Leaf Spot and Spring Black Stem. Adapted for hay, haylage, or grazing purposes, KSC EXTENDER IV delivers consistent performance under a wide range of climatic and soil conditions. Characteristics include superior establishment, excellent persistence, fast recovery after cutting and exceptional winter hardiness. FSG 420 LH Alfalfa exemplifies all of the most recent advances in conventional alfalfa breeding. This alfalfa came from a selection process designed to modify the fall dormancy/winterhardiness relationship resulting in an alfalfa that combines later fall dormancy with excellent winterhardiness. Having fast recovery after cutting an an excellent disease/pest resistant package, FSG 420LH has the potential to produce high yields and high quality hay under sprayed or unsprayed field conditions in areas where potato leafhoppers are an economic concern. FSG 524 alfalfa is at the top of its class witha superior combination of winterhardiness, very fast recovery after cutting, high multifoliate leaf expression for improved forage quality and great forage yield potential. FSG 524 alfalfa is ideal for the commercial hay grower or dairy producer using an intensive cutting management schedule or for those on a less intensive 3 cut management schedule. FSG 524 is adapted to all areas where fall dormancy 4 and 5 varieties are planted. 428RR is one of the latest generation Genuity Roundup Ready alfalfa varieties that lets you produce, cleaner, higher quality alfalfa for greater profit potential. The simplicity and improved crop safety of using one herbicide with the widest window of application available, enables you to be in control instead of Mother Nature. 428RR alfalfa performs well over a wide range of environmental conditions and is adapted to all areas where 3, 4 and 5 fall dormancy varieties are planted. 428RR alfalfa also features a disease index rating of 30/30 and high multifoliate leaf expression for improved forage quality. Whether it's for great forage yields, superior forage quality, or very fast recovery after cutting, 428RR alfalfa is the choice for commercial hay, beef and dairy producers who want to take advantage of Genuity Roundup Ready technology.